Anne Goetz works closely with Dr. Jeff Popp during surgeries. She also makes pre- and post-op calls, as well as nurse calls. She started in August 2015. “If we do an eye surgery, I help him hold different instruments. Sometimes I cut sutures or perform Exilis treatments,” she said. 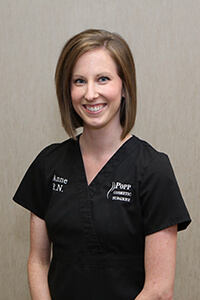 Anne came to Dr. Popp after she worked in an emergency room for five years. Anne said the team she joined is committed to providing great care. Anne said the patients are different than those she treated in the ER. She said it’s cool to see how Dr. Popp, whom she calls “detail-oriented,” can change people’s lives for the better. When Anne isn’t working, she spends time with her husband and dog. She likes to boat, swim, garden and bake.